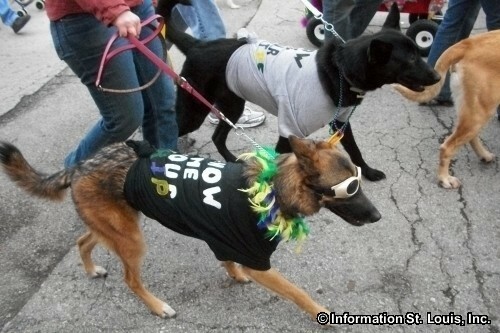 The St. Louis Mardi Gras presents the annual "Purina Pet Parade" that will take place in Historic Soulard. This pet parade holds the Guinness World Record for the largest costumed pet parade in the world and is fun for the whole family, whether you are a participant or just a spectator! See the website for an online registration form for you and your pet or register on the day of the parade at 10am, at the corner of 12th and Allen. A $10 donation to the Open Door Animal Sanctuary is asked for to participate in the parade. The parade begins at 1pm at the corner of 12th Street and Allen Avenue. It is FREE to just come and enjoy the parade. The Coronation of the best-costumed dogs takes place immediately following the parade, at the Soulard Market Plaza at 8th and Lafayette next to Soulard Market. Checkout the Taste of Soulard or the Wiener Dog Derby after the parade. See the website for more details on ALL the Mardi Gras events. Directions: Take Broadway to west on Allen Avenue to the corner of Allen and 12th Street. Or Gravois to east on Allen Avenue to 12th Street.